Today, I unfriended everyone on Facebook and unsubscribed from every group to which I belonged. My decision was not based on a terrible incident, or fear of government spying – definitely not the latter, as my father had worked for the NSA in the 1970’s on a project called Echelon. Nor did I do it to make a statement. It is a very personal decision. I did it because of the noise. I felt like something had been lost. My thought process had moved from “I cannot wait to share this with so and so” to “I can’t wait to share this with Facebook.” It was shotgun-communication. It was impersonal. It is disturbing when you reflect on it. I tried unsubscribing from some people, and blocking all game requests, and only using Facebook on the weekends. But every time I logged in, even to do some maintenance on one of Eternal Revolution’s pages, there was this barrage of opinions, thoughts, tidbits, graphics and information that was not directed to me personally, but yet pushed through the boundary into my sphere. We’ve lost touch with the inner life, driven to distraction. When the ceaseless flow of information stops, when I got caught up on my timeline, I felt a need to consume more. And how much of it was relevant to what God and I were working on today in my life? Very little. I felt as though I lost something in interpersonal skills. Instead of constructing a message through email to send to an individual person, crafted however briefly, I was broadcasting a message to hundreds of people at once. And not everything was relevant or necessary for them to know. Thus I was imposing on others with most of my messages just as they were on me. My networking skills grew lax, as I could always rely on Facebook to serve up the information or keep tabs on others. I want my communication and use of the gift of language to be intentional. I know a lot of good people who are changing the world without Facebook. And all the great ones who have in the past did not use it. So obviously it is no requirement for making a difference in the world, or in yourself. It might even be the opposite. I won’t delete my Facebook account, as I still will use the pages for Eternal Revolution and feed information there, but by unfriending everyone I cut myself off from that particular social network. For my friends, or any one else that wants to communicate something to me, there are dozens of direct ways to contact me – phone, email, postal service – you know how to find me. And I can reach out to you, intentionally and directly, as well. I really do try to avoid Facebook. The few times I popped on, though, my feed was full of reactions to goings-on in the news, even from bloggers and writers that I follow for their essays. A politician did or said something stupid and frightening, something obscene happened on a tv show on a channel I never watch, and some person whose respect I do not require nor desire said something that offended people. I suppose that could wrap up any given week, come to think of it. A while ago, I had come to the conclusion that I did not want this blog or these essays to be reactionary to current events. There is enough of that on the internet already. There is probably too much of it already. With every scandal, every fear mongering news story, every public figure that does something shocking and moronic there is a flurry of opinion pieces and analysis, even from Christian writers. I refuse to play that game. I did my stint in the news, having written for LifeNews.com and American Life League’s magazine, and public relations for a number of ventures in addition to that. I have even done several opinion pieces on old incarnations of this blog. There is something to getting the story. There is something else entirely to forming your opinion about what is going on, and to a lesser extent a need to express that opinion on occasion. But when that is your daily grind, you are letting the world lead you. There is a concept in board gaming that goes as far back as chess and go. Play your own game. 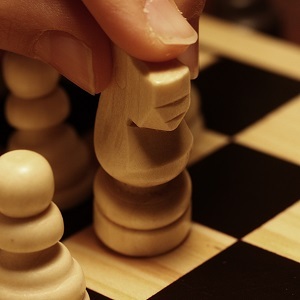 If your moves are always in reaction to your opponent, you are playing their game. That is the way to defeat. To win, you need to take the initiative, to lead, and to make your moves have merit on their own basis. In life, it is important that you are making your decisions based on your path in Christ, irrelevant of the chaos in the world that has been, is now, and will be until kingdom come. Don’t take your eyes off the New Jerusalem to keep reacting to what is going on in Babylon. Play thy own game.